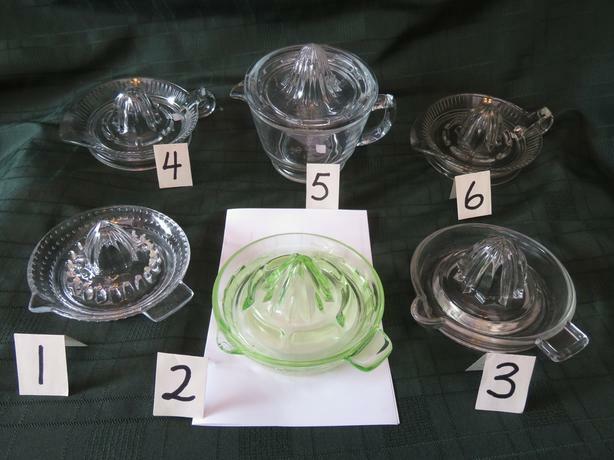 This is for a group of Vintage glass collectable Citrus Reamers / lemon squeezers. Prefer to sell as a group but will sell individually. These are vintage are all used so show signs of wear and use. 1. Glass reamer - 20 raised posts in ring around center . Two rows of small dots around outer rim. 5 1/2 " across. 2. Glass reamer - Vaseline Glass. Picture under Black Light. 24 small panels at base of outer rim. 5 3/4 " across. Good condition except for small chip under the spout and another on rim of base. 3. Glass Reamer - Unusual form. Totally plain with no design around central dome . 5 3/4 " across. 4, Glass Reamer - 8 ridges around center. Outside rim has many small vertical ribs. Glass has a grey tinge. 6 1/2 across. 5. Glass reamer with matching bowl. FIRE KING Not for oven or microwave use embossed in base. Very Scarce Vintage item. Reamer part no handle has 8 slots to allow juice to go into the cup, 5 across. Cup 3 3/4 ' high - 6 3/4 ' across. capacity 1.5 cups. 6. Glass Reamer - very similar to #4, Pouring lip a little wider and glass has faint yellowish tint. Call 250-656-0549 No Saturday or Friday evening calls. other ads by " rapsent "
Aquariums 1 gal to 90 gal.